With the new Hyster XT series quality comes as standard 7 days a week. The Hyster XT delivers core Hyster toughness and dependable features in a cost-effective package. Explore a week in the life of the Hyster XT below and see how it makes a difference every day. Quality is all about selecting the right tool for the job. When you’re looking for a forklift truck that you can count on, the key is to find one that gives you the level of quality you need, but at a good price. Time to meet the Hyster XT. Built in the UK using high quality components and workmanship, delivering reliable performance and design life of more than 10,000 hours. Available with either diesel or LPG engines, giving maximum uptime that your business can depend on. The Hyster XT - getting the job done every day. Your site might not be covered with potholes, but your trucks will probably have to operate on uneven ground. Not only can this impact on a truck with durability issues, it can also affect how well it functions in your workplace. Particularly if there are long pauses while the mast settles after making a lift, or it needs to slow down while travelling on rough surfaces. With the Hyster XT durability comes as standard. The XT is a solid and no-nonsense machine that is designed to travel quickly and confidently over rough surfaces. Its overhead guard adds structural strength and is rigid, resilient with smooth transitions, and it is also designed to give the driver a clear view. A dealer who can’t deliver, who is slow to respond to your needs or to supply parts can cause your business problems. The wrong dealer might lower purchase prices to tempt you in. But lifetime costs might end up higher. Time to meet the Hyster XT and Briggs Equipment. Briggs Equipment is the exclusive dealer for Hyster in the UK. They provide pre-sales advice, competitively priced maintenance contracts and post-sales support. They have a strong national network and a large team of forklift technicians to support it. What’s more, Briggs shares Hyster’s commitment to the rapid availability of parts. A truck that is not tough enough to withstand the rigours of your working conditions will impact on your business. In your line of work you are not looking for an indestructible truck, you are looking for one that is designed for your operation. In the forklift market the name Hyster is synonymous with toughness. The Hyster XT upholds this reputation. Every component in the Hyster XT must meet Hyster’s stringent quality and durability standards. The Hyster XT’s tractive and hydraulic systems also provide a lifetime of confident operation. If your forklift truck fails to start at the beginning of your shift, what will you do? No matter how versatile and powerful your forklift is, you need confidence that it will work as it should. Hyster forklifts are manufactured to the highest standards of quality and dependability. The Hyster XT’s Yanmar diesel engine features super quick glow plugs for reliable starts in cold conditions. The quality of the components ensure its reliability and the forklift is supported by Briggs Equipment. 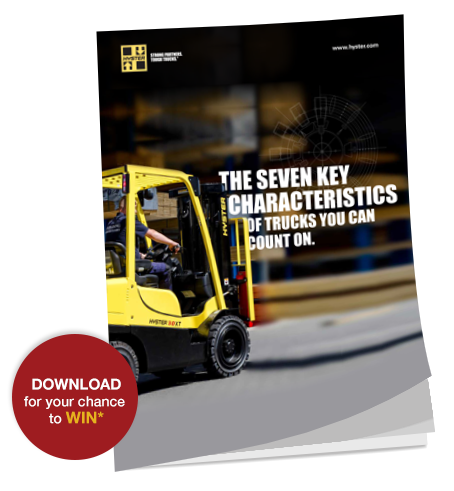 There is a real risk of false economy when purchasing a forklift truck. Forklift trucks with lower price tags might seem tempting, but they will soon turn out to be a cheap trick if they deteriorate prematurely and begin to impact on uptime. The Hyster XT is a quality truck at an affordable price. The key to finding the truck at the right price point for your business starts with having a clear idea of your specifications. The XT is designed for standard expectations, features fuel-efficient engines and is easy to maintain. The Hyster XT also comes with a variety of flexible finance options which can be shaped around your circumstances. You need to be confident in your forklift. But you also need to have confidence in your dealership and the brand you’ve chosen. It used to be hard having trust in all these elements. By choosing a premium brand at the right price, you can be confident about the quality, durability and toughness of the forklift. You can also be assured that the Hyster XT will meet each day’s target across your operations. What is more, you can be confident that the dealership will provide you with support and confident in the quality of your investment. All of which enable you to focus on what matters most, running your business. The Hyster XT - quality comes as standard. Read more below. The XT uses high quality Hyster components. The quality of the XT gives users enduring and reliable performance. Delivering a design life of more than 10,000-hours. The XT is available with either diesel or LPG engines giving maximum uptime that your business can depend on. The XT is built in the UK with quality workmanship in the same factory that we have been using for 35 years. The Hyster XT - durability comes as standard. Read more below. The Hyster Stability Mechanism (HSM™) ensures that the Hyster XT remains steady while making turns or travelling over rough surfaces. The mast design on the Hyster XT gives excellent all-round and through-mast load visibility. There is also minimal settling time after lifts. The elastomeric-mounted hydrostatic steer axle and the fully floating drive axle ensure reliability and heavy duty performance. The overhead guard protects the driver from heavy falling objects while allowing all round visibility, and is also designed as an integral strengthening element of the forklift. The Hyster XT - support comes as standard. Read more below. Briggs Equipment will make sure that you have the right truck for your needs. They will also offer you a variety of finance options to make payment easier. Maintenance contracts from Briggs Equipment are competitively priced and will cover the truck for its lifetime. Thanks to a strong national network and a large team of technicians, Briggs Equipment can keep your operations moving. Briggs Equipment shares the same commitment to rapid parts supply as Hyster. A fast-track ordering system brings even the rarest parts to your premises. The Hyster XT - toughness comes as standard. Read more below. The name Hyster is synonymous with toughness. Its reputation is built on generations of tough trucks and intelligent design. Every component that goes into the Hyster XT, or any Hyster truck, must meet Hyster’s stringent quality and durability standards. Hyster has created the tractive and hydraulic systems of the XT which provide toughness, power and rigidity - giving a lifetime of confident operations. Hyster has been building trucks at its UK factory for over 35 years. During the lifetime of the brand Hyster has worked to continuously improve its forklifts. The Hyster XT - dependability comes as standard. Read more below. The Yanmar diesel engines on the Hyster XT feature super quick glow plugs to ensure quick and reliable starting, even in cold weather. The Hyster XT is made of quality components and with quality workmanship. It is also easy to maintain, ensuring maximum performance. The Hyster XT is built to last. It will not suffer premature wear and the whole truck will give you a lifetime of low-cost operation. The Hyster XT is backed by Briggs Equipment, the exclusive Hyster dealer in the UK. Briggs Equipment is a dependable dealer who will do everything to keep the forklift operational. The Hyster XT - cost effectiveness comes as standard. Read more below. The XT features applications which are needed for standard operations. Features that would only be needed for intensive or specialised work are kept out to keep the cost low. The XT has fuel efficient engines which help to save you money. The PSI LPG units can be switched between two performance modes to match the nature of each task. Your dealer can offer you a variety of flexible finance options which can be shaped around your circumstances to make payment easy. The Hyster XT is designed so that you can get easy access to all components to minimise the time and cost of scheduled servicing. The Hyster XT - confidence comes as standard. Read more below. Hyster trucks have a reputation for toughness and quality. The Hyster XT benefits from many years of Hyster development and manufacturing experience. With the Hyster XT you can plan your operation confident in the knowledge that it will not let you down, thanks to features like the super quick glow plugs in the Yanmar diesel engine. You can be confident that the Hyster XT will perform well in your workplace, thanks to features such as the Hyster Stability Mechanism (HSM™), which enables your drivers to work swiftly on rough surfaces. You can be confident that you and your business will be supported by Briggs Equipment, the exclusive Hyster dealer in the UK. Tough, reliable and made for everyday use, the H2.0-3.0XT forklift series in diesel or LPG is built for a wide variety of indoor and outdoor applications, in sectors including logistics, distribution and manufacturing. To find out more or to request a free hands-on demo, contact your local dealer using the form below. GETTING THE JOB DONE EVERY DAY. The Hyster XT is supported by Briggs Equipment, the exclusive UK distributor for the full range of Hyster forklift trucks and warehouse equipment. Contact Briggs Equipment today to discuss the XT or to arrange your hands-on demo. Can you count on your truck to get the job done every day? When downloading our eGuide you can also enter into our prize draw for a chance to win a monster truck experience day for you and your team! © Hyster Copyright 2016, All rights reserved.